I’ve always considered WEB much more than a thrash metal band, but since it’s the “basis” of their work, and we have this necessity of labeling everything we see and listen to, then thrash is probably the best label. 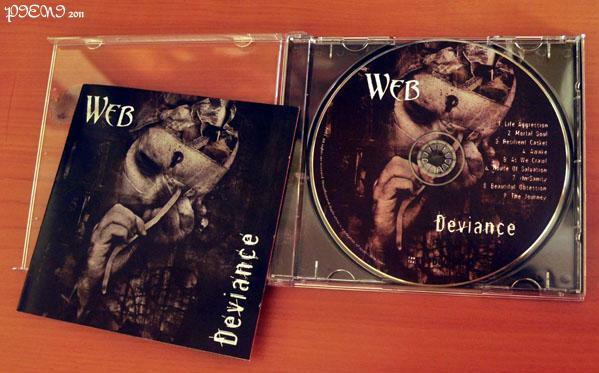 As to prove that, “Deviance” starts off with a theme of very fast guitars, strong beats and Nando‘s voice is so deep that I almost didn’t recognize him. The gang vocals used on the chorus of this “Life Aggression” reminds me of some eighties classics as, for instance, TESTAMENT‘s “Over The Wall”. The last minute and half brings us some Arabic melodies which I hope they can deliver live, as it’s a very characteristic part of the song. It’s one of my favourite. Still about how to classify this band, “Beautiful Obsession” leaves no doubt, once again: Pedro‘s drumkit seems about to explode at any moment, and the strings of the other three musicians keep up with it. For the violence I’ve described, any of these songs could have made it to single. But for the same reasons, “Awake” was the chosen one. It’s been playing on the band’s MySpace since December, and the stereos of 100 people who got a free copy at Invicta X-Massacre II. It’s songs like “Mortal Soul”, “As We Crawl” and even “House Of Salvation”, where thrash meets doom, that reveal the “much more” I mentioned on the first line. After listening to them so many times live (especially “Mortal Soul”, another favourite) it’s refreshing to listen to them now without eventual technical problems or the roar of the crowd, and be able to fully enjoy their quality. “The Journey” is WEB‘s epic moment. A dark theme, full of musical “embellishments”, and maybe that’s why it doesn’t get boring, despite its almost eleven minutes length. If there was anything I didn’t like? The cover. The graphic work is really well done, but I don’t fancy the image chosen. It’s supposed to represent our psychological deviances, but I honestly can’t see how sticking a piece of iron through our left eye passes that message. Musically, it was worth it to wait 6 years.